As an Elfant Wissahickon REALTOR, I am trained to guide you through the necessary steps for the successful sale of your home. Contact me today to get more information and to get started. Your Elfant Wissahickon REALTOR will tour your home and research current market conditions and comparable sale information, helping you determine the best price for your home and how much you may net from the sale. Competitive Market Analysis: We research recent sales of homes similar to yours in your neighborhood to help us define a price range. We take into consideration any improvements you have made to your home, any defects you do not plan to correct, and the time frame in which you wish to sell your home. As your property is actively on the market, we may revise our presentation & pricing based on feedback from appointments. We will prepare a ‘Seller’s Cost Sheet,’ outlining the net proceeds you can expect from the sale. This includes any mortgage payoff(s), unpaid property taxes, judgments or liens, commission, transfer tax and settlement charges. Depending on the time of year in which you sell your home, you may be reimbursed for any prepaid property and school tax. In order for us to represent you in the sale of your home we must enter into a written Listing Agreement. The PAR (Pennsylvania Association of REALTORS) Listing Contract defines the responsibilities of your Broker and Agent to you, as well as your responsibilities to the Broker and Agent. All the terms of the contract will be reviewed with you. These terms include the length of the contract, a commission schedule and permission to market your property in various ways. You will also provide pertinent financial information including mortgage and tax information. Please see our ‘All Points Checklist’ to prepare for the sale of your home. Most properties sold in the commonwealth of PA are required to have a completed and signed Seller’s Disclosure. Notices from the back of page 6 of the PAR Agreement of Sale: The Real Estate Seller Disclosure Law requires that before an agreement of sale is signed, the seller in a residential real estate transfer must make certain disclosures regarding the property to potential buyers in a form defined by the law. A residential real estate transfer is defined as a sale, exchange, installment sales contract, lease with an option to buy, grant or other transfer of an interest in real property where NOT LESS THAN ONE AND NOT MORE THAN FOUR RESIDENTIAL DWELLING UNITS are involved. 1. Transfers that are the result of a court order. 2. Transfers to a mortgage lender that result from a buyer’s default and subsequent foreclosure sales that result from default. 3. Transfers from a co-owner to one or more other co-owners. 4. Transfers made to a spouse or direct descendant. 5. Transfers between spouses that result from divorce, legal separation or property settlement. 6. Transfers by a corporation, partnership or other association to its shareholders, partners or other equity owners as part of a plan of liquidation. 7. Transfer of a property to be demolished or converted to non-residential use. 8. Transfer of unimproved real property. 9. Transfers by a fiduciary during the administration of a decedent estate, guardianship, conservatorship or trust. In addition to these exceptions, disclosures for condominiums and cooperatives are limited to the seller’s particular unit(s). Disclosures regarding common areas or facilities are not required, as those elements are already addressed in the laws that govern the resale of condominium and cooperative interests. Our agents tour all new listings on a weekly basis to familiarize themselves with your property and confirm price and presentation. Your Elfant Wissahickon REALTOR along with our marketing team will tailor an advertising campaign specific to your home. 93% of Buyers begin their home search on the web. Our website advertises all of our listings and features state-of-the-art search options. We subscribe to extensive online networks including REALTOR.COM, the #1 real estate website nationwide. 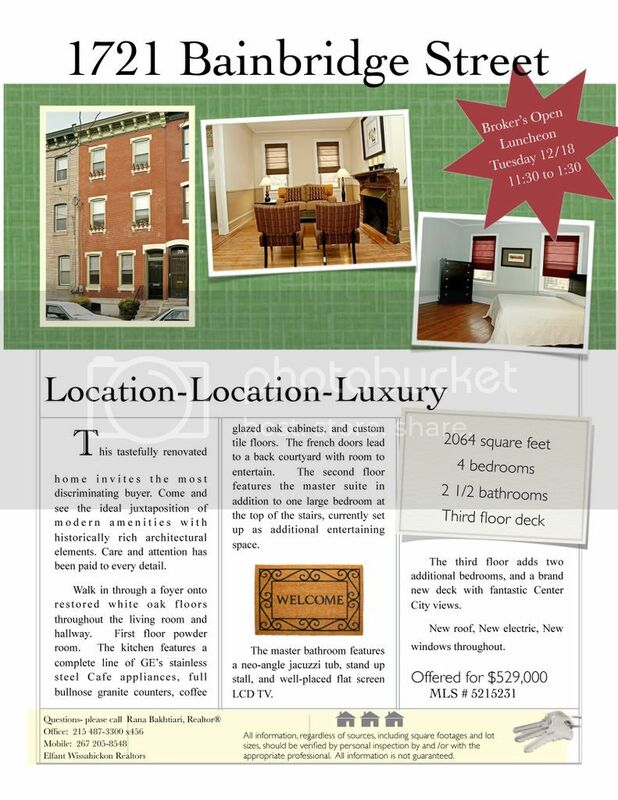 Our print advertising covers the Greater Philadelphia area. Your Elfant Wissahickon REALTOR® along with our marketing team will tailor an advertising campaign specific to your home. Your Elfant Wissahickon REALTOR will establish a schedule to maximize exposure of your home to the marketplace. The more often a home is shown, the more likely a sale will occur. We have an appointment center staffed seven days a week to schedule appointments for your home. Your REALTOR will work out an appropriate schedule for showing your home, decide how agents will have access to your home, and review any alarm or other special instructions. Agents from our company and cooperating Brokers call our appointment center when they want to show your home and, upon confirmation, are given instructions on gaining access to your home. We request feedback from the agents that have shown your home. This helps us advise you regarding pricing and presentation. Most buyers will not relax and closely inspect a home if the owners are present, so try to arrange to turn the home over to the salesperson. If you must remain at home, refrain from talking unless questions are directed to you. All too often, a seller will attempt to point out some special feature, fearful that it may be overlooked. Please bear in mind that some of the most successful salespeople will say little or nothing during showings. First, they have made their selling points before entering the house, and second, they want the buyers to discover some things for themselves in order to build excitement. The salesperson also knows the buyers’ temperaments. Trust the salesperson’s professional abilities. When you receive an Agreement of Sale, your agent will help you make the right decision about negotiating and accepting an offer. When a buyer offers to purchase your home, they will be required to provide substantial documentation that supports their offer. All offers presented to a seller must be accompanied by a pre-approval letter from a qualified lender and a Buyer’s Financial Information sheet. If they are offering cash for the property, a financial statement is also required to provide proof of adequate funds. Your Elfant Wissahickon REALTOR will review the documentation with you to help you make a decision about the acceptance or negotiation of this offer.The expertise of Elfant Wissahickon REALTORS will help you understand the various terms, contingencies and responsibilities outlined in the Agreement of Sale. Your home is Sold! We will help you prepare for a successful settlement. Congratulations! Your property is SOLD. The Buyer takes possession of the property by accepting the signed deed, the keys and taking physical possession. Your proceeds are distributed as assigned by you and the title company. All parties named on the check must endorse the check or it may be returned by the bank.